Growing Consumer Use Makes Geothermal Heating/Cooling a Hot Topic - Ground Loop Heating and Air Conditioning, Inc. Despite an uncertain economy, geothermal heat pump adoption is increasing in the United States. Over 1,000,000 geothermal (or ground-source) heat pumps are used in U.S. residential, commercial and government buildings. 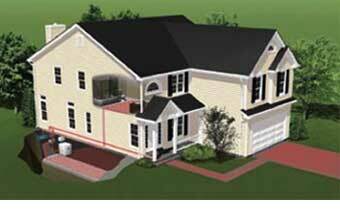 And each year, U.S. homeowners install approximately 50,000 more geothermal heat pumps. American homeowners are clearly warming up to the fact that green geothermal energy is available anywhere in the United States – literally in their own back yard, thanks to ground water heat pumps. The big news: compared with other sources of energy, geothermal energy is only beginning to reach its potential – even though the history of geothermal energy in the U.S. dates back more than 10,000 years and first geothermal ground-source heat pump was installed in 1945. The greenest heating/cooling system available, geothermal energy has the most potential of any known energy source. To further increase geothermal energy use, the U.S. government is offering tax credits for new installations. You can also get information on state incentives for geothermal installation here. Geothermal energy use and heat pump adoption has also been rapidly growing outside the U.S. and especially in Europe. Energy contractors in many states are finding it challenging to keep up with the sharply increasing demand for geothermal heating and cooling. What’s more, the rates of homegeothermal system installation in some parts of the U.S. may be increasing even faster than official figures show, because some homeowners haven’t yet filed for the energy tax credits available in some states. When they decide to “go green” for their home heating and cooling, many of today’s homeowners choose WaterFurnace geothermal heat pumps. Join the many homeowners who are enjoying greener, more energy-efficient heating and cooling — contact our knowledgeable sales representatives at Ground Loop.. This entry was posted on Sunday, July 13th, 2014 at 8:22 pm. Both comments and pings are currently closed.